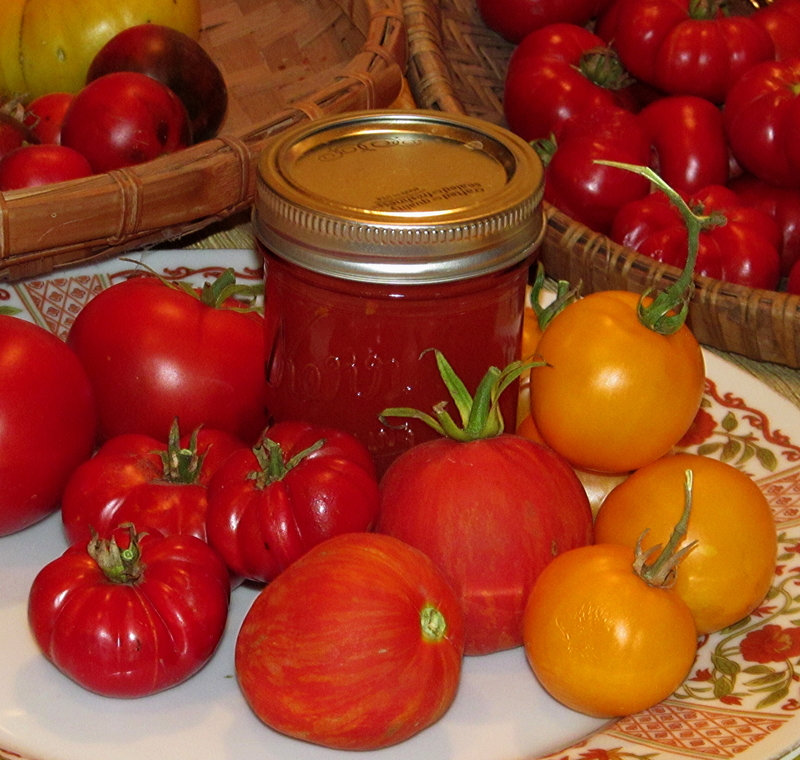 An afternoon's harvest in early October. Our warm, dry weather before the rainy season extends our harvest of summer vegetables. 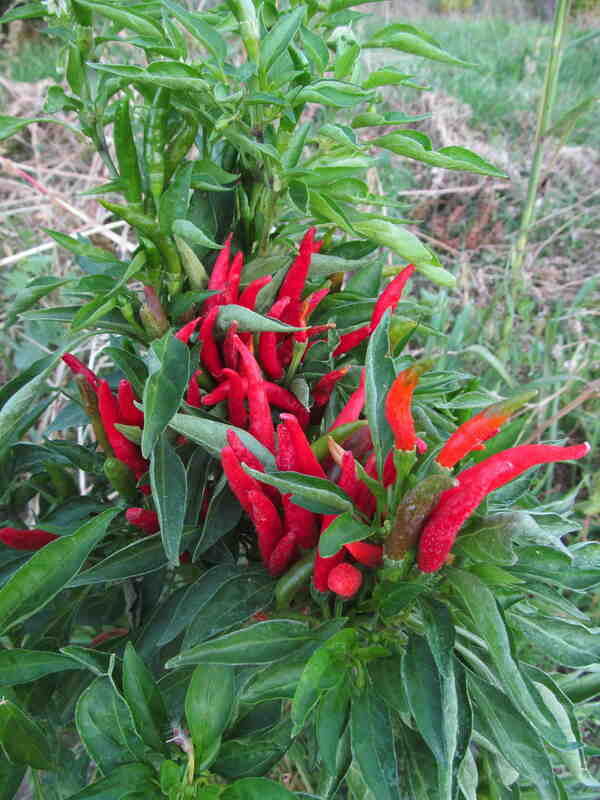 Thai pepper plant ready for harvest. Cut it off at ground level, hang it upside down in the garage. 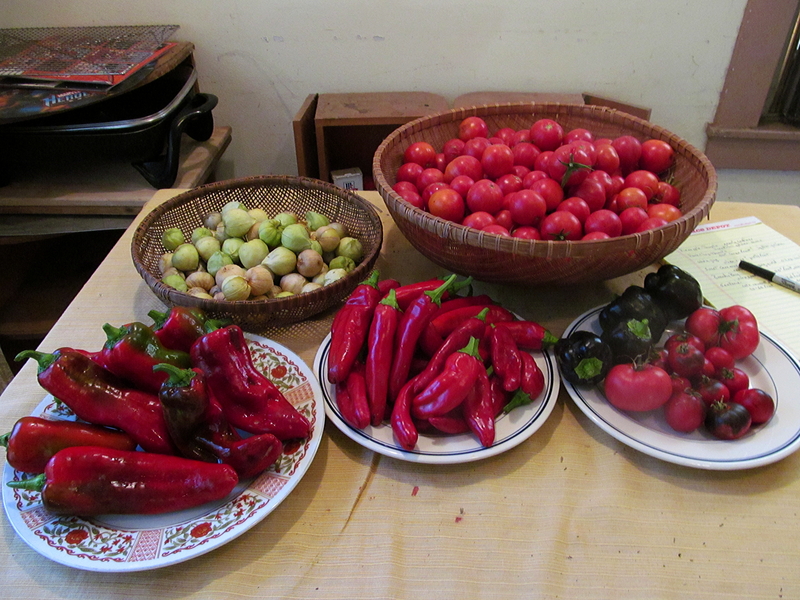 Foliage will wither away and pepper pods will dry out, ready for storage in a few weeks. They keep for months. Cayenne peppers a few weeks after drying. You can store them in jars or just leave them in a basket on the counter. Caution: very hot! Pineapple tomato is an heirloom variety with golden flesh suffused streaks of red. It makes a beautiful orange-gold puree with sweet flavor, great as a base for salsa. Try something new? 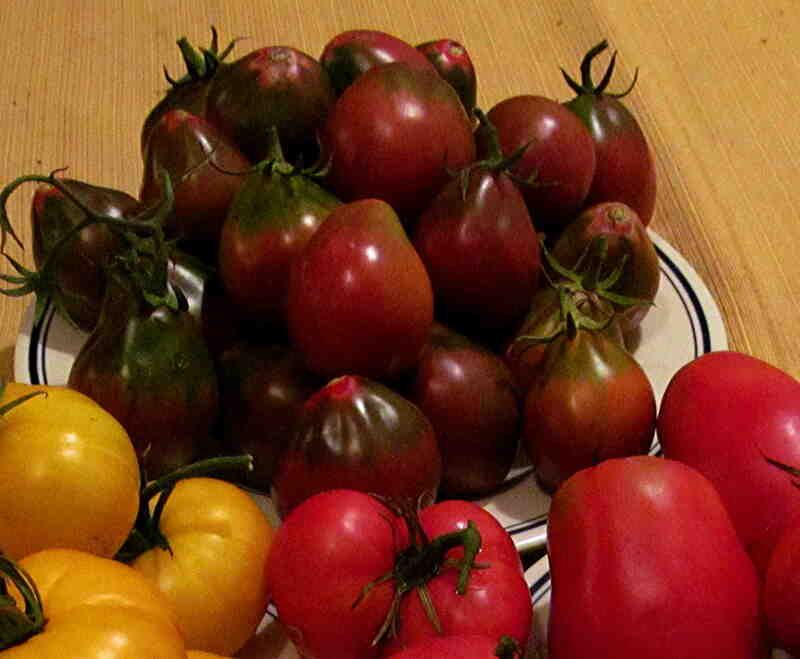 There are a lot of different colored tomato varieties on the market now; some hybrids, some open-pollinated. Your puree will be the color of the variety, so consider separating and processing the different varieties. Some are sweeter, some have stronger flavors. 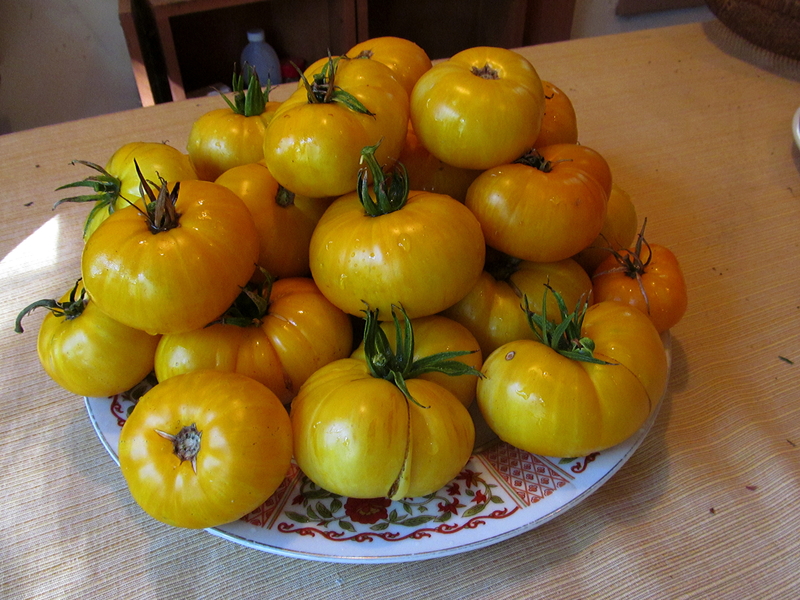 Pork Chop is a new open-pollinated tomato that is light yellow. The flavor is sweet, and the production is phenomenal. I got more than 60 fruit, average 12 - 14 oz., from a single plant. Red Boar is actually orange-pink with red stripes. 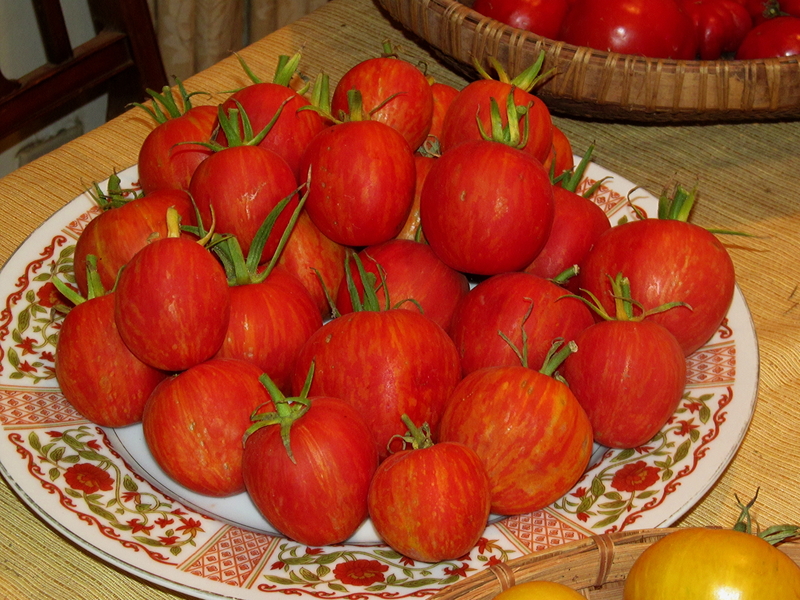 It produced very well, has great tomato flavor, and made a bright orange-red sauce. 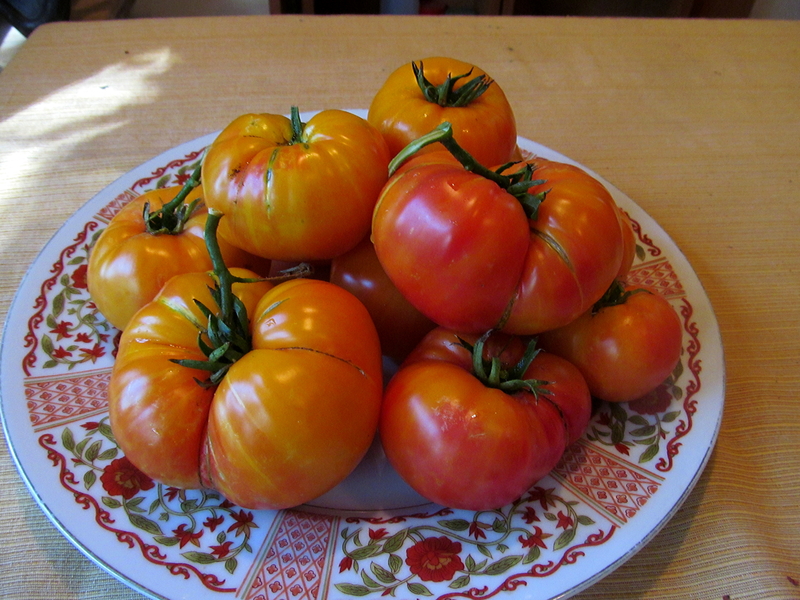 Wine Jug is a dark, almost purple-red tomato, very meaty with few seeds. 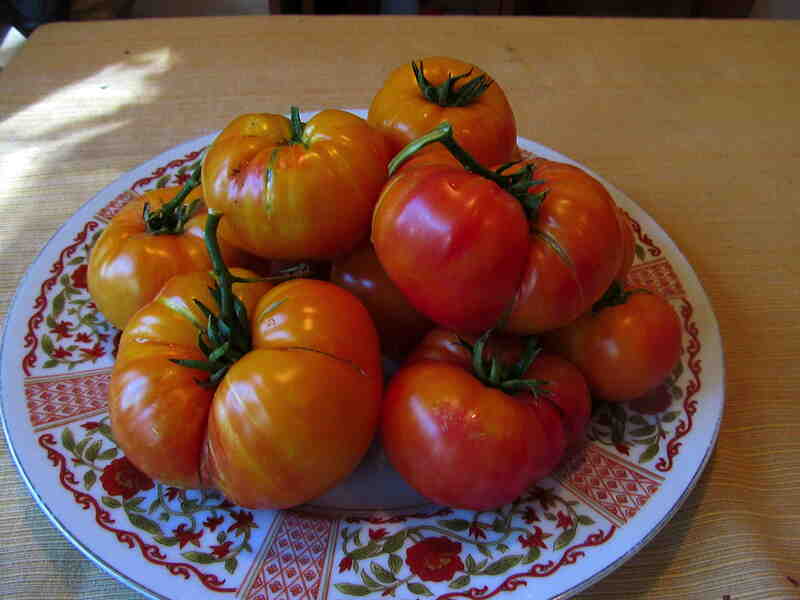 This new open-pollinated variety looks like an interesting addition to a mixed tomato planting for colorful fruit, and it makes a very thick rich puree. I've learned to cut back my basil plants in August when they flower to force new growth. That gives a flush of leaves that you can harvest in late September and October. 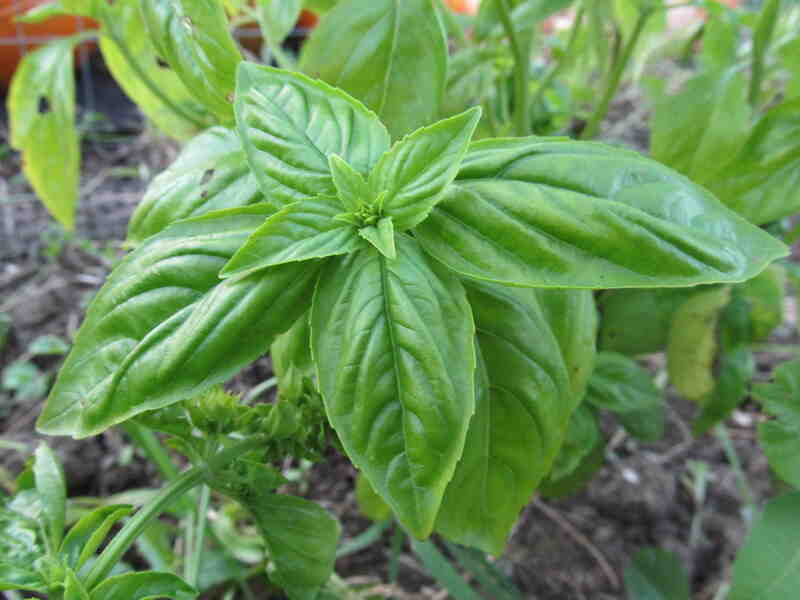 Basil can be dried, frozen whole, or made into pesto and frozen. It's a simple process when you're using the freezer. Cut the fruit and remove any bad parts. Simmer until soft, mash and blend. Simmer again for awhile. Strain to remove seeds and skin, simmer the remainder down to thicken it. Then freeze for use in winter and spring. Sorting through my mother's files recently, I came across a remarkable one in her household folders. Starting in 1981, my mother recorded all the garden produce they had put up for the freezer. They had been gardening actively at this house since building it in 1953. I think the list began as a way of keeping inventory of what was in the large freezer, but my mother is a methodical and consistent archivist. So began an annual listing of what she and my father cut up, blanched, roasted, packed in syrup, and otherwise prepared for future meals. We didn't live on a farm! This is a normal suburban yard in coastal Southern California. It wasn't so much the total volume that impressed me, it was the fact that they processed and froze something nearly every week, sometimes a couple of times a week, every year, from March through November. A couple of pints here, a few quarts there. And as my mother often proudly said, she ate "something from the garden every day of the year." For nearly sixty years. It is a diverse list. The mild climate there doesn't happen to favor the traditional fruits, but it does provide exotic things like feijoa, nopales, and loquats. In her tidy handwriting I also see olives and pickles, applesauce, and loads and loads of tomatoes, roasted Anaheim chili peppers for rellenos, beans, and squash. I remember Brussels sprouts and chayote, prickly-pear fruit syrup, ridiculous quantities of zucchini, tomato vines that grew up onto the roof, and the year I grew a fourteen-foot tall sunflower plant. There were vigorous Olallie berries strategically placed for passers-by to help themselves. I remember my dad spending six Saturdays in a row trying to make the perfect berry pie. We kept telling him the recipe wasn't 'quite' right yet, so he'd try again the next weekend. Eventually he caught on to us, or ran out of berries. She grew horseradish (lesson: process it out on the patio, it's pungent! ), and made the mistake of planting mint in the garden. In later years my father developed a passion for pepper plants and enjoyed growing as many types as he could. They didn't process food because they had to. They did it because they liked growing their own food, and because it is what they, or at least my mother, had known growing up. A child of the later depression years, she came of age during World War II, and folks just did that sort of thing if they could. She told me of her childhood years in the Black Hills of South Dakota, finding chokecherries for jam and growing Victory Gardens. Mostly corn and cucumbers at that elevation and latitude. Thinking back on it, very few of our neighbors had vegetable gardens. Fruit trees, sure. Maybe a couple of tomato plants. But few were as avid at growing food as my parents. And there has never been a time in my life, then or now, when I didn't have a vegetable garden at the place I lived, except for my brief stint in the dorms as a student. I've made my share of mistakes, mostly having to do with planting too much of a particular thing. But processing a big pot of tomatoes every few days is just part of the background in late summer and fall. So I guess I got that gene. We are seeing a return to home growing of vegetables and fruits, not just as a trend but as a way of life. People want healthy, fresh food, and the best way to get that is to grow your own. And we're seeing a return to food preservation, which follows naturally from that. Our dry, sunny October weather leads to an abundance of early fall produce, and I talk to people who are a little overwhelmed by it all. So here are a couple of suggestions based on my experiences. 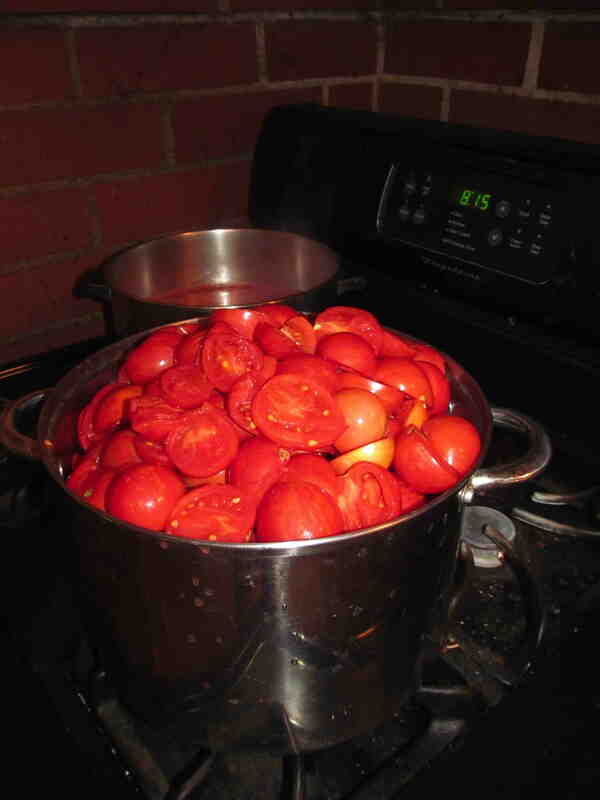 My favorite thing to do with a major harvest of tomatoes is just boil them to soften, puree them, strain them, simmer more to thicken by about half, and then freeze it. Process it now, season it later. What you want in December is fresh tomato flavor, and you can decide then if you're making pasta sauce or enchiladas. One exception: I do take the remainder of the basil in the garden and blend it into some tomato sauce before simmering it down. Basil also freezes whole. Just spread the leaves out on cookie sheets until frozen and then pack into freezer bags. The fresh flavor is there months later, but keep in mind the leaves will turn black. I like to keep the yellow tomatoes separate and make a special puree just from them. Yellow tomatoes tend to be sweeter but milder in flavor. Their puree makes a great base for salsas because their tomato flavor doesn't overwhelm the peppers: you can just chop in some mild and/or hot peppers and onion, and salt to taste. One batch of the yellow tomatoes gets blended with equal parts tomatillos for salsa verde. Your family, particularly if they were raised on commercial condiments, may want more salt, more vinegar, and even some sugar in the final product (you can wean them off that later, or use a little fruit instead). If you have the freezer space, small tomatoes such as Roma or Juliet can be frozen whole. Just spread them out on cookie sheets, freeze until solid, and then seal them in freezer bags. When you run the frozen tomato under tap water, the skin will peel right off. I process (carefully! wear gloves) hot peppers much as I do tomatoes. In fact, I often combine some tomato puree with the peppers, boiling and blending into a puree. I often add some vinegar and salt and maybe a little fruit for sweetener, and then freeze the result. Note from mom: label these carefully! You don't want to put hot pepper sauce into your spaghetti by accident, and they look alike in the freezer. 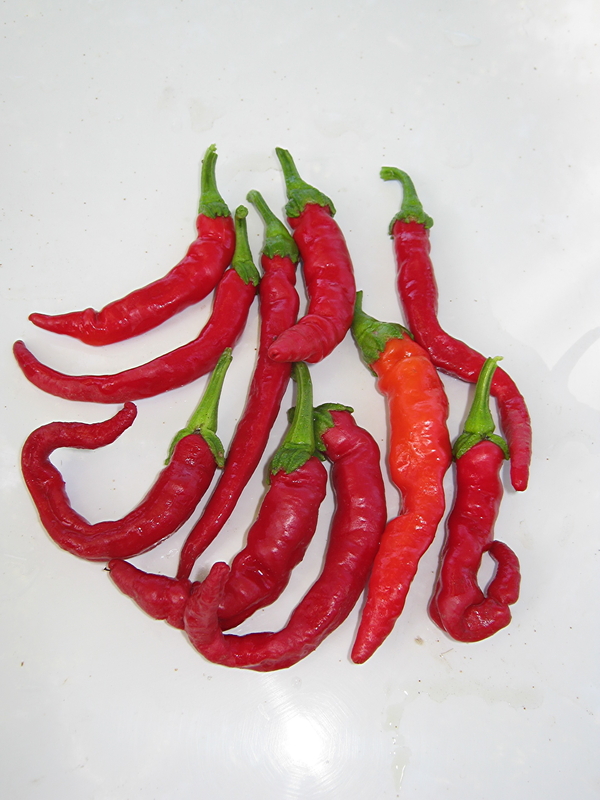 Smaller and thinner-skinned hot peppers just get dried. I cut the plant at ground level when frost or rain threatens, then hang it upside down in the garage. You can do this indoors, but it smells funky for the first few days. Within a few weeks the peppers are dry enough to store. This is the simplest way to keep Thai, pequin, and cayenne peppers through the winter. You certainly can process all of those tomatoes and sauces in canning jars and seal them that way. That's fun to do and saves on freezer space. My parents did that, and I have done it many times. An extra deep pressure cooker gives nearly 100% success at sealing jars. But my experience is that canning is something of a production, and I just find it's harder to get around to it. I think their approach of a little bit processed every few days is much less daunting to the average gardener with a busy schedule. Chop, simmer, strain, and freeze you can do in an evening while working on other things. Mom's last entry was last October. Age and illness kept her from planting a vegetable garden this year for the first time in six decades. Good news, mom: you passed it on to at least one of your kids, and I have quite a record of accomplishment to live up to. Thank you.